Elite Taekwondo sixth Dan Master Manni. With the full-time, state-of-the-art Geelong studio, sixth Dan Master Manni looks to pave the way for his students to achieve their goals. “It is such an amazing place to train,” he says. “Our facilities are fantastic. Our club is such a family friendly place to train and our whole system covers absolutely everything. “Each term covers self-defence, technique work, patterns, sparring drills, and concepts in our sparring classes as well as fitness, flexibility, agility and fun fitness-style classes Kicks, Flips and Ninja Tricks. Elite Taekwondo has taught self-defence at local schools including Geelong Grammar along with Kardinia International, Clonard, Western Heights, and Christian colleges. Disability and corporate groups have also had classes. 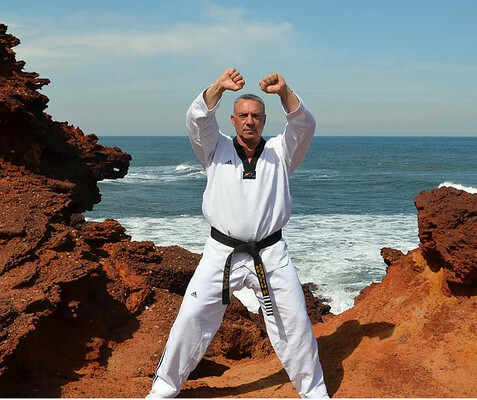 After beginning taekwondo as a young child, Master Manni developed his teachings around the constant, progressive nature taekwondo sparring systems, which have been in the Olympics since 1988. His firsthand knowledge of self-defence through senior roles in security has also served him well. Elite Taekwondo is ideal for anyone wanting self-defence skills, improved fitness, increased flexibility, and greater self-confidence. Suitable for all ages and abilities, Taekwondo Australia classes are safe, friendly, and family-orientated. All the qualified coaches are certified in first-aid and have undergone working with children checks. Taekwondo classes resume Tuesday 29 January. For more information phone Cathy on 0418137144.